Wake up late, work out, deal with any outstanding matters, enjoy a leisurely lunch, catch a taxi to the airport and arrive well in advance of the scheduled boarding time, leave Vancouver at 3:00 p.m., arrive in Vegas at 5:30 p.m., check in, unwind, then head on over to Scarpetta for our 8:00 p.m. dinner reservation. Well, that was the plan anyway. Maybe, in some ideal alternate universe, that’s the way it went down but in this reality, things went a little differently. Arrived at the airport to discover the flight had been pushed an hour. Then an hour and fifty minutes. Then two hours and ten minutes. Then two and a half hours. 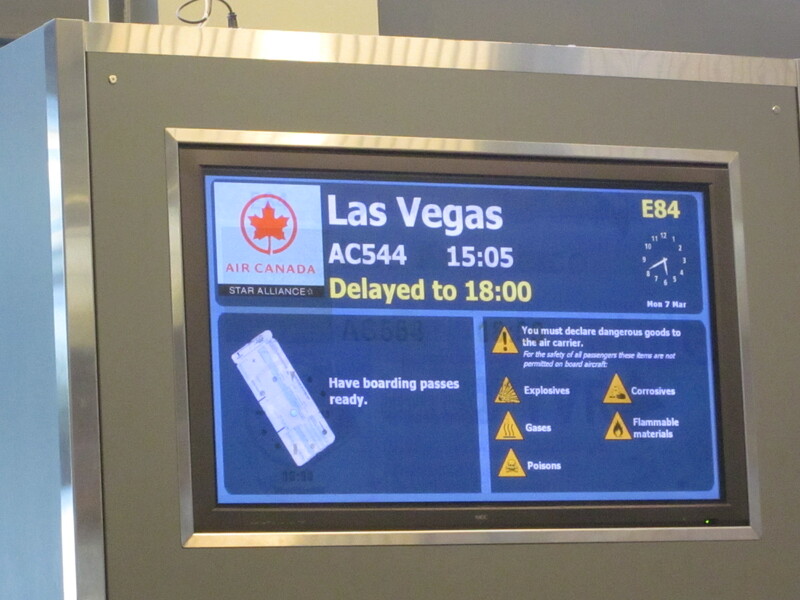 Apparently our plane was delayed coming out of Toronto. The reason for the delay? No one, not even the Air Canada staff, had a clue. Finally, the plane arrived. Iwas good to go! Unfortunately, Air Canada wasn’t. We had to wait for the cabin crew to clear customs. “Wait a minute,”I protested. “The flight crew had two and a half hours to clear customs!” I was informed that because of the delay, they had to switch out the assigned crew with a crew coming in from an international flight. We finally left Vancouver, three hours late, made up no time in the air, and finally touched down in Vegas very, VERY late. A mad rush to the hotel, a hurried check-in, followed by breakneck charge to The Cosmopolitan andI was finally sitting down to dinner – formerly scheduled for 8:00 p.m., then pushed to 8:30 p.m., then pushed to 9:00 p.m., then pushed to 9:30 p.m., but it wasn’t until 10:00 p.m. that I finally sat down. Of course the late dinner meant I was able to enjoy the company of an old friend who made the drive from L.A. just to see me – and enjoy dinner at Robuchon and e by Jose Andres. No, not Paul Giamatti. My former culinary wingman, Golden Boy Martin Gero, showed. Of course, you wouldn’t know he was once my culinary wingman given that he hardly partook in any of the dishes I’d ordered – two appetizers, four pasta dishes, and three desserts. Apparently, he’d eaten on the way. Eaten at In And Out Burger! Puree of Chestnut Soup with oxtail, celery root and smoked robiola dumplings. 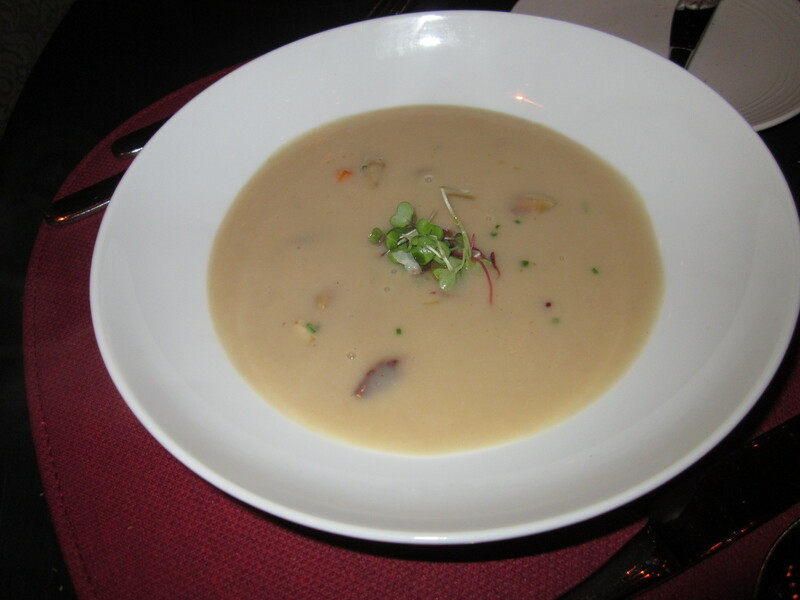 Good although the oxtail lost a lot of its typical marbled succulence in the soup. I thought the addition of the sliced almonds a nice textural touch. 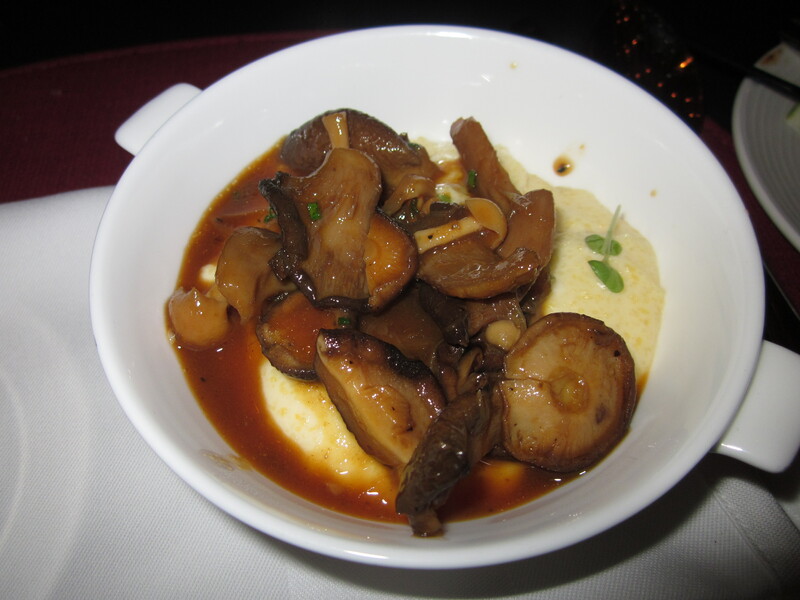 Creamy Polenta with wild mushroom fricassee. Many people I know object to polenta because of its texture, almost akin to firm mashed potatoes, but I thought it worked wonderfully here with the fricassee. One of my favorite dishes of the night. 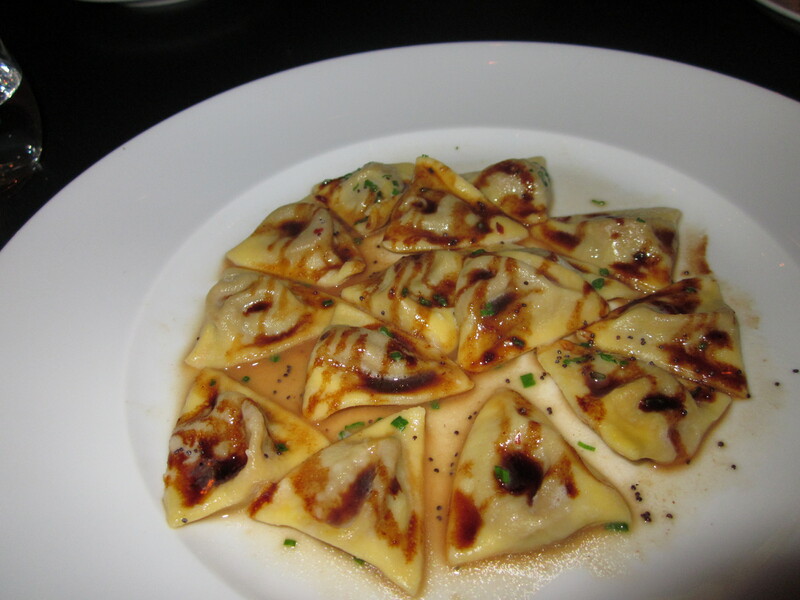 Pasta Dish #1: Duck and Foie Gras Ravioli with Marsala reduction. Given the Marsala reduction and foie gras, I thought this dish would be sweeter, a little more robust. Instead, it was possessed of an unexpected sharpness that, ultimately, left me kind of disappointed. Pasta Dish #2: Agnolotti dal Plin with mixed meat and fonduta, mushrooms and parmigiana. 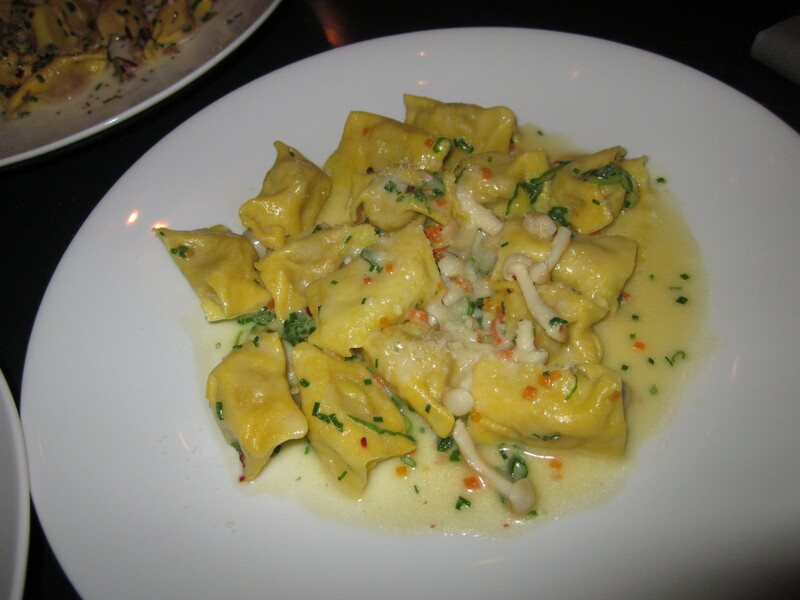 A good dish that impressed me more for its preparation (perfectly al dente as were all the pastas) than its flavors. 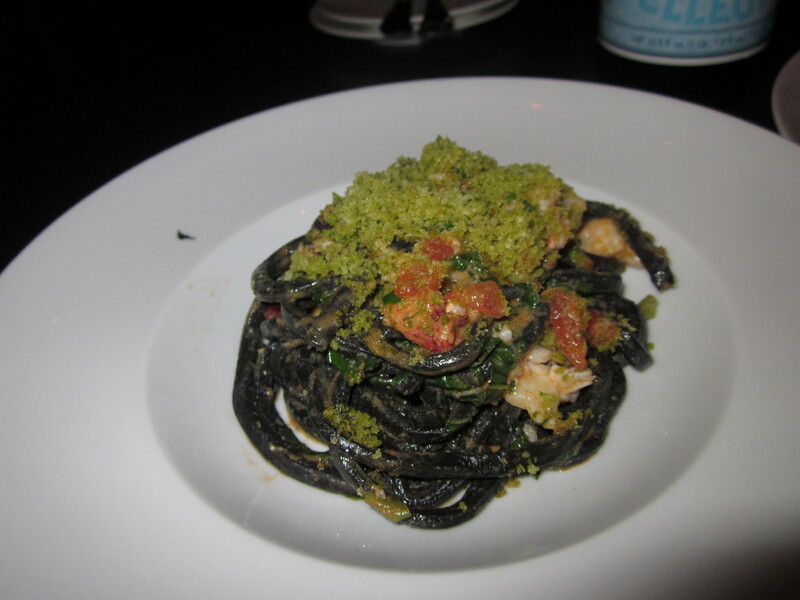 Pasta Dish #3: Black Macaroni with Main lobster and basil bread crumbs. Multi-layeredcolors, textures and flavors made this one a table favorite. Again, the pasta was perfectly cooked with that nice, firm al dente bite I truly appreciate - that many Italian restaurants fail to achieve. 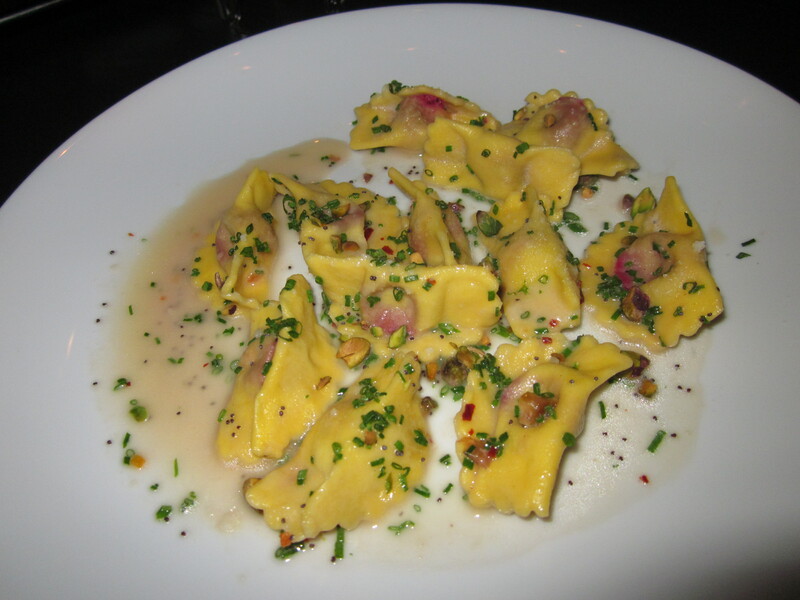 Pasta Dish #4: Beet and Smoked Ricotta Casonsei with pistachios and poppy seeds. An utterly delightful surprise and my favorite pasta dish of the night! Subtle, sweet, and toothshome! 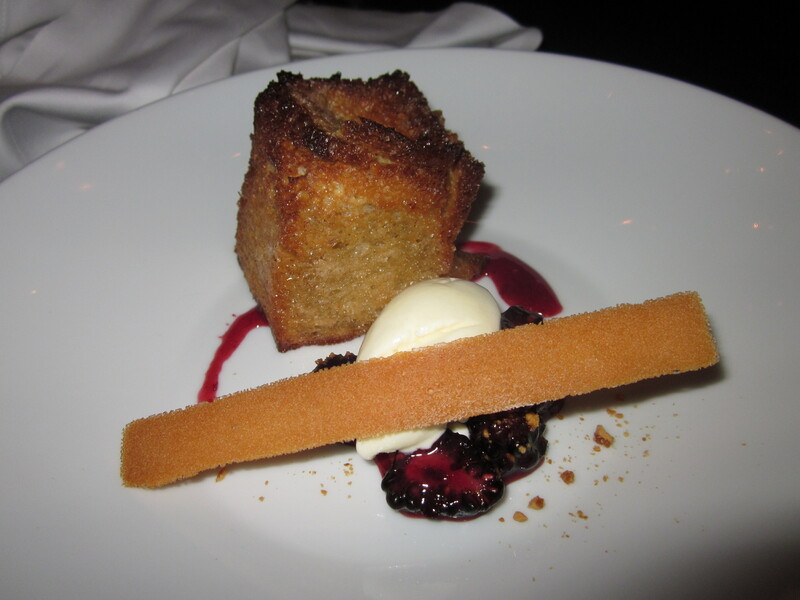 Apple Crostata - cinnamon-sugar brioche, mascarpone gelato and blackberry compote. Sounded better than it was. I'm not a fan of pies or any similar desserts in which the crust is so easily separated from its filling. The highlight was the mascarpone gelato but the crostata to gelato ratio was off. 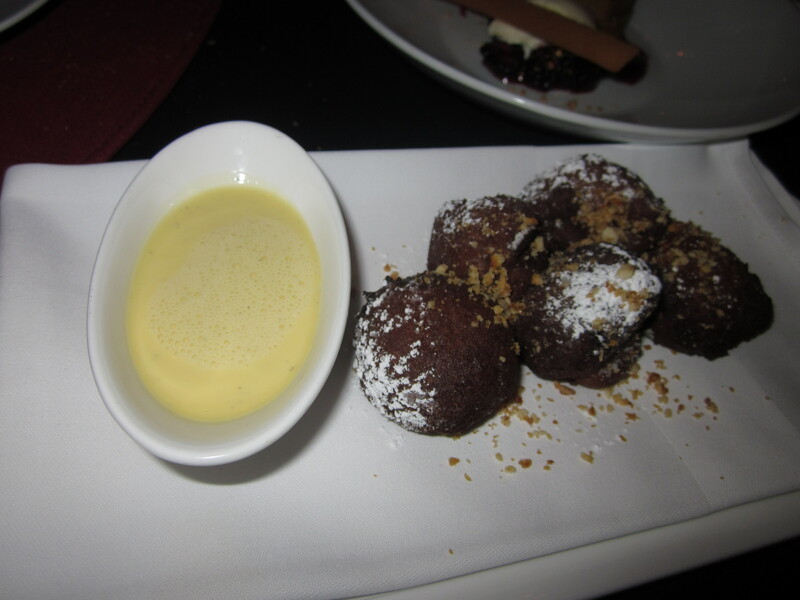 Zeppole - nutella center, vanilla sauce and candied hazelnuts. Alas, a disappointment. I was missing the promised nutella center. 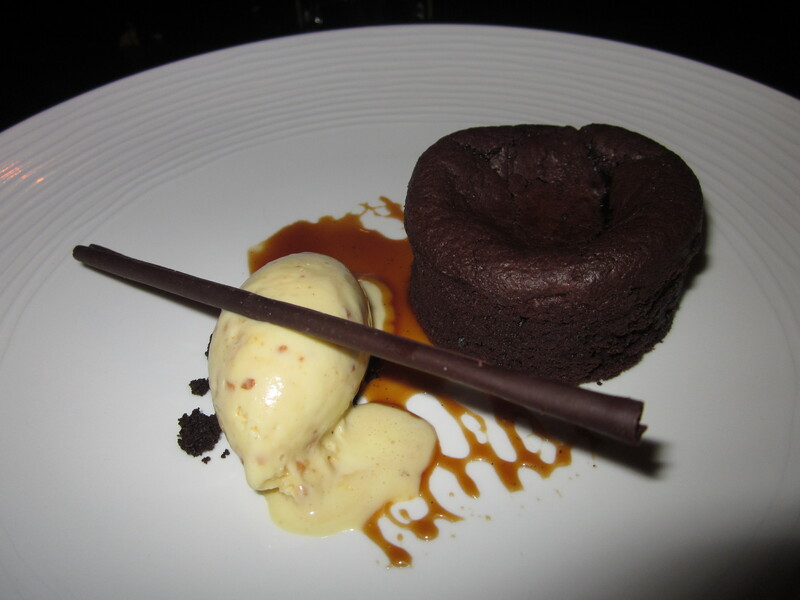 Amedei Chocolate Cake with toasted almond gelato and salted caramel sauce. The richest dessert on the menu (I checked to make sure) delivers a BIG chocolate hit in the form of the greatest sof-centered chocolate cake I've ever had. And using my favorite chocolate no less. My only quibble was, again, with the cake to ice cream ratio. I'm a firm believer that it should be 1:1, one spoonful of ice cream to accompany each spoonful of cake. Otherwise, a terrific dessert. Way past Marty G.’s bedtime. On our way out, we passed owner Scott Conant himself, standing at the bar chatting with customers as they left the restaurant. He seems a lot more friendly and down to earth when he’s not berating you for undercooking your fish or improper plating. I told him I enjoyed my meal. In retrospect, I should have mentioned my ice cream to dessert ratio issues. I was exhausted by the time I got back to the hotel and just conked out – waking up at 4:30 a.m. when the hotel alarm clock went off. I eventually got back to sleep and woke up again at a far more reasonable and much later hour. It was fine. Found the pizza too salty. The sundaes to finish the meal were good. 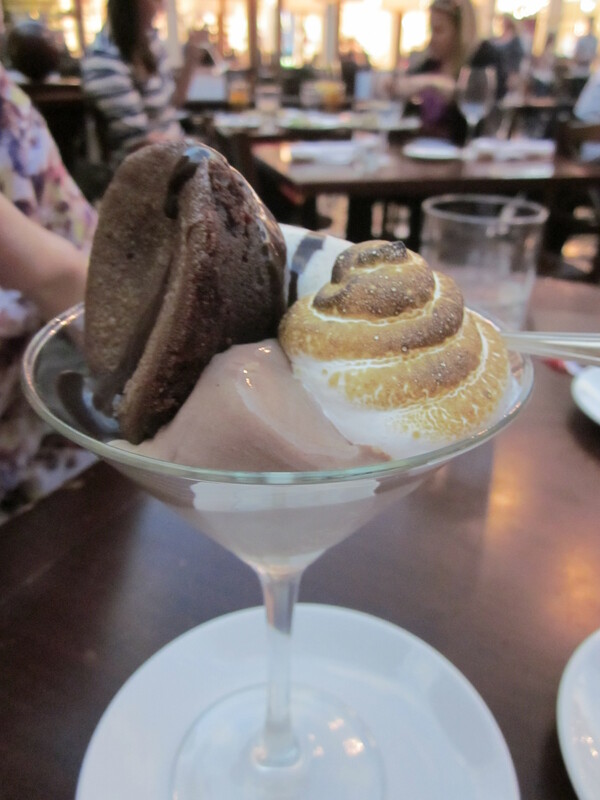 Dark chocolate cake with graham cracker gelato and meringue. 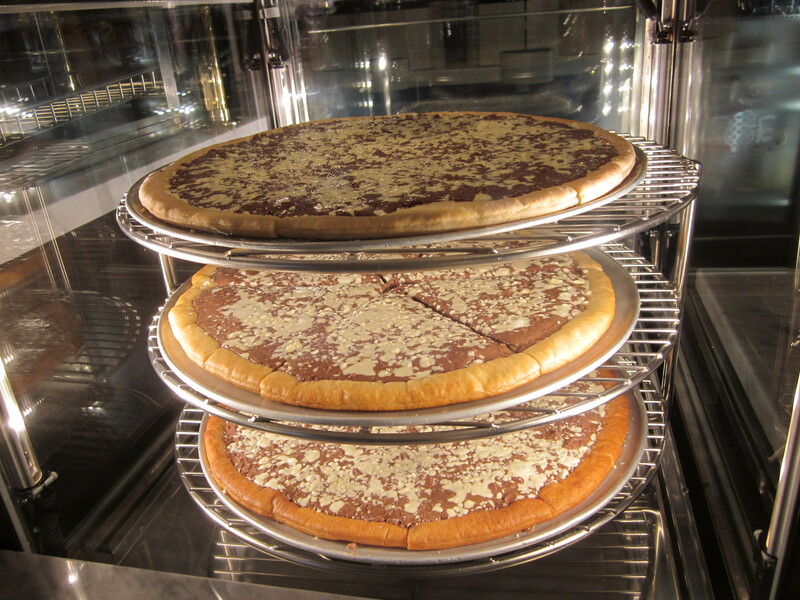 Milk chocolate, white chocolate, and sweet pizza dough. 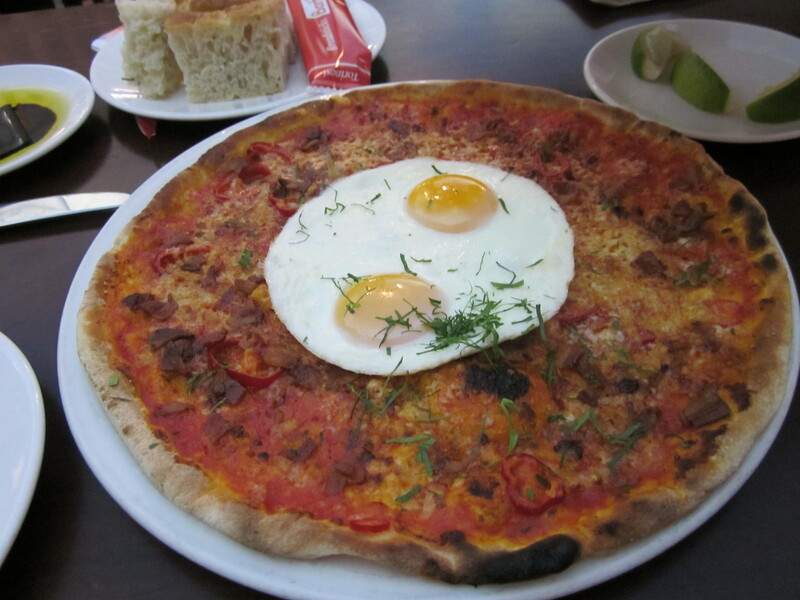 I found the dough had an undercooked quality that made it difficult to stomach. Oh well. 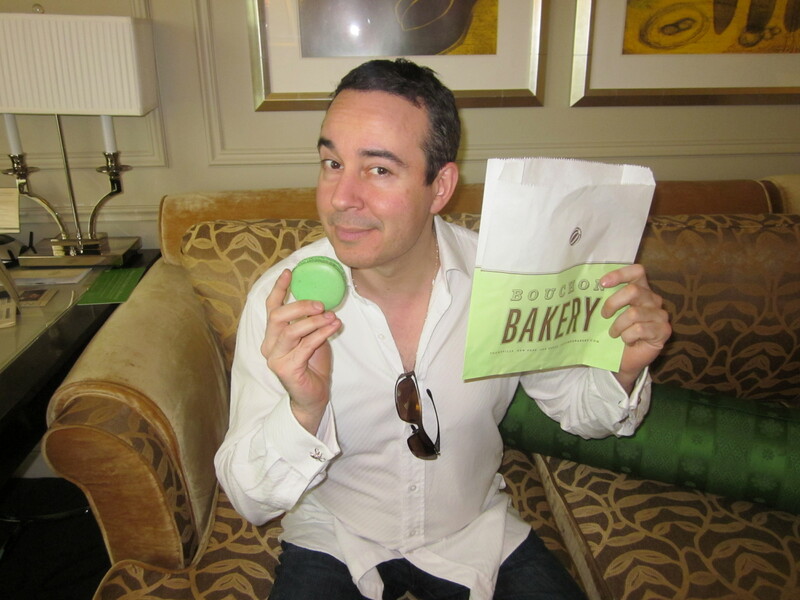 Lacked the fresh, crisp integrity of the macarons I enjoyed in Tokyo. Overly sweet and chewy. While shopping for sunglasses, I received a call from my writing partner, Paul. Apparently, the American broadcaster has signed off and we’re officially on board this new project. Stay tuned for the grand announcement. Or, barring a grand announcement, I’ll just fill you in on this blog in the coming days. Off to meet up with Marty G. at Joel Robuchon. Wish us luck! Previous Article March 7, 2011: Vegas-bound! Stargate: Universe behind-the-scenes secret pics and video! 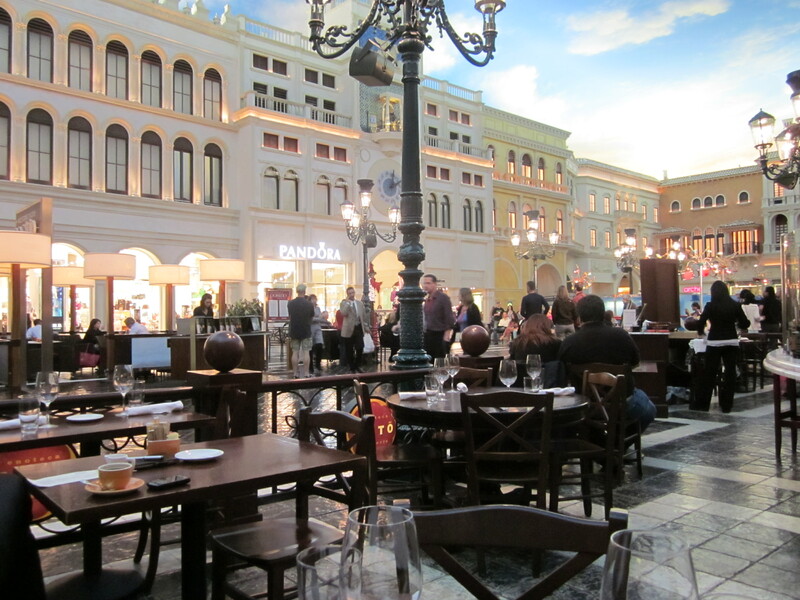 Next Article March 9, 2011: Vegas Day #2! Dinner at Joel Robuchon! Marty has an epic beard…. I wish I could have a beard like that……. Honestly, Joe, I don’t know how you’re not 400 pounds with all that great food. Glad you made it to Las Vegas safely and looking forward to the grand announcement!! just what I need. More places to try out next time I’m in Vegas. Appreciate the food reports, pleasure to see Mr. G. again, and hope you have lots of fun. Dang, sorry about all the delays but you are rocking on through your vacation. Can’t wait for the official announcement! Yum. I had fishsticks for supper. How does one make black macaroni? I want to know, I neeeed to know, I love making pasta. Well, I love to hate making pasta. I gave away my machine, but still can roll and cut noodles by hand. Don’t you know that airline times are just made up lies. The tighter you schedule is, the longer they push off you flight. I want to eat with you. I am surrounded by people that argue if burger chain A or burger chain B are better restaurants and have a birthday dinner for their 90 year old Grandmom at a chain and think that they did something special. I am three hours from NYC, I will meet you there. Save me. I am starving. I see you’re good friends with Murphy too Joe. All the food pictures look awesome! Marty G looks fabulous! Are you wearing your shirt out to cover up your elastic waist pants? Congratulations on your now official new job. I guess this means you really do have to go to Toronto now. The black macaroni looks wild. The crostata looks tasty, I’m apple pie crazy. 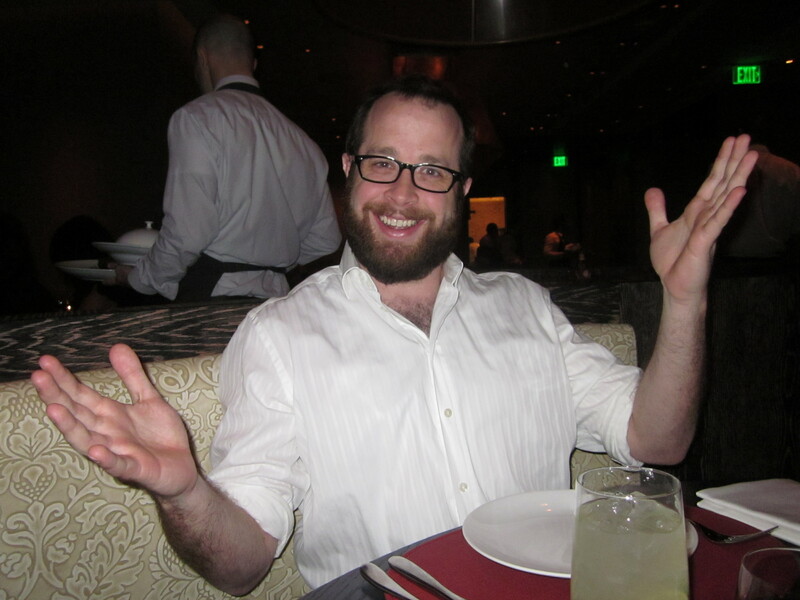 Maybe you should grow a Vegas beard for the weekend. Yum, thanks for sharing. please sir can I have some more.? I agree with the ice cream ratio, is that in short supply also. 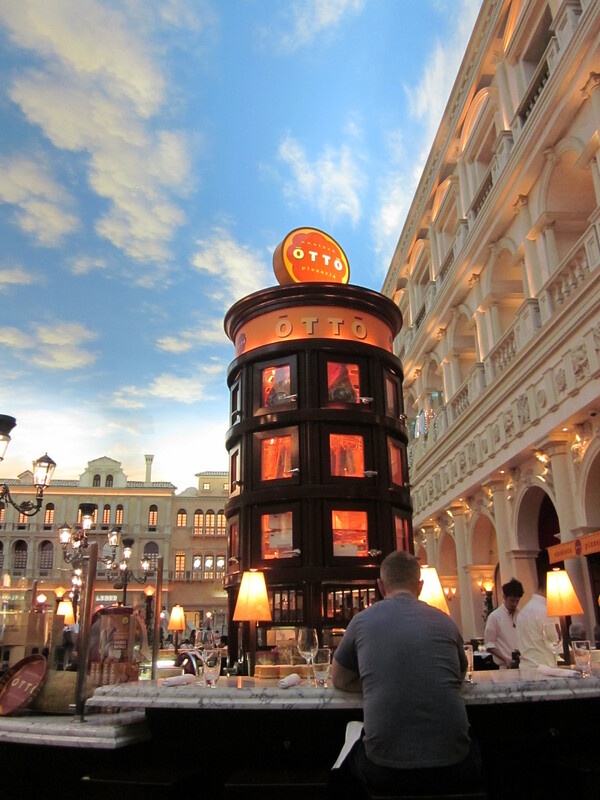 Its been a while since I have been to vegas, Mario Batali’s looks interesting. I like the desserts,,yes sir, thanks. Better rest up now and digest. This is kind of like a March 7/8 entry or am I losing it since it is not 10:00 pm yet. Glad you are having a good time. Oh, yum! Those dishes look delectable. Sorry that they’ve been hit-and-miss. Hopefully, you’ll meet with better luck during the rest of your visit. On another note, I am *trying* to catch SGU’s newest episode on Space tonight, but I am not getting any reception. The station is blacked out! Aaarrgghhh. Hopefully, they’ll show a re-run soon. I really want to see it. And a final comment…. In recognition of the 100th Anniversary of International Women’s Day, may I share with you this article from Maureen Ryan, which lists SF’s most memorable female characters (http://www.tvsquad.com/2011/03/08/sci-fi-memorable-female-characters/). Sam Carter is on the list! And, there is a Sam/Jack shippy element that she noted, which made me doubly happy (see the Author’s Note). In any case, I just wanted to offer my thanks to you and the SG writers for creating one of the most outstanding female characters on TV, someone who is strong, intelligent, caring, and resourceful. 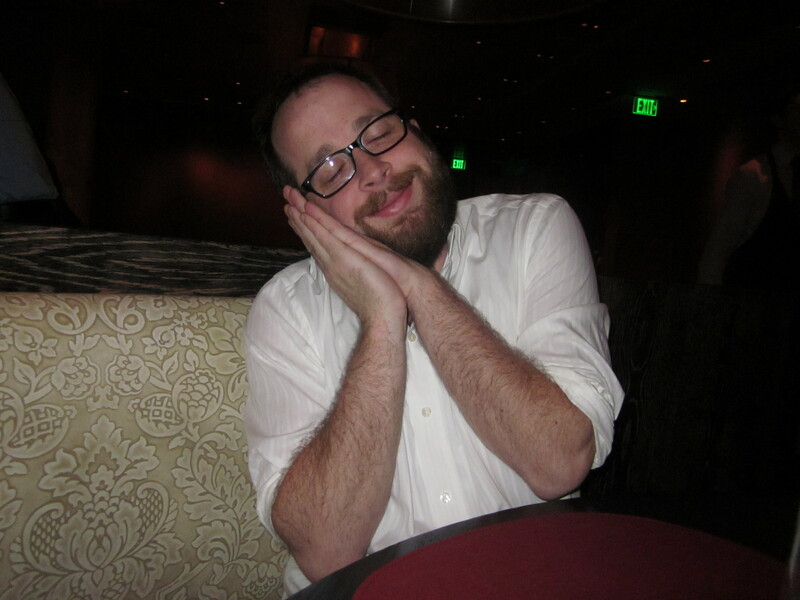 It looks like you are having a great time in Vegas. I heard there is a new place that opened up at the Tropicana hotel if I am not mistaken. It is an exhibit where there have virtial images of all the eraly 1900’s famous gangsters. From what I heard it is pretty cool to check out. About SGi… Last night episode was without a doubt the best episode I have ever seen from Staragate. The strory line and visual FX were amazing!! They were so lifelike and believeable. I would have to say that is was one of the best VFX I have ever seen for an extended period of time on either television or theater. The VFX guys did an awesome job. The last 2 episodes were great. From what I can see the next 9 epiosdes all look great. I think you guy are hitting homeruns with every episode now. It is such a shame that the show got cancelled. After seeing last nights episode it made me even more upset that the ending is soon coming. I also saw today that Robert Carlyle got hired by ABC for a new show coming up. so it looks like the cast is starting to find new work now. So it is getting more and more bleak for any continuation. I think Carlyle is one of the strongest characters on the show and I love what you have been doing with his character. I really like the way Rush has been becoming quite a bit more likeable by the crew and by me!! Thanks so much for the great entertainment! Congrats on the new project. And GREAT JOB on the mid season premiere last night!!! I loved the way Robbie Carlyle played Rush in this episode! He is always good, but he really kicked it out of the park in this episode!!! -a credit to his ability, and of course great writing. I was particularly fond of the little moment between him, Volker, Brody, and Eli. It was very touching, then he goes and spoils the moment with the next line, loved it when he confessed to Eli that he felt they would just get in the way!!! However, you really get the impression that the character has changed at the end of the episode… WELL DONE!!! Many people found Chloe to be a somewhat boring character. Did you and the other producers/writers consider somehow developing the character more to satisfy the fans? Someone commented on a Gateworld article that they thought the Stargate franchise needed to take a hiatus for a few years to make a reboot feasible. Do you think this is feasible? If a reboot were to happen, would you try to be involved? Finally caught up with last night’s ep, and it was great! A bit bittersweet watching it, though…knowing that it won’t be much longer before the end. Also eagerly anticipating your big announcement. Can’t wait for you to be able to talk about it openly. Enjoy the rest of your Vegas trip – don’t come home with an STD! OR worms! i’m looking forward to the grand announcement. BTW the pic of you with the macaron reminded me of this site that i stumbled across a few days ago: http://foodzie.com/ the have macarons & bunch of chocolate, as well as other stuff. DC Entertainment seeks a Creative Director for the Creative Group department. Req no. is 121568BR. While shopping for sunglasses, I received a call from my writing partner, Paul. Apparently, the American broadcaster has signed off and we’re officially on board this new project. If I had to choose between culinary delights or a burger, i’d choose the culinary delights. one can always wolf down a burger, but to actually be able to eat marvel food; frakk me, that must be awesome. I loved your photos from the SGU set, it made watching SGU even more sadder. Marty grew a beard? Mr Joe were you satisfied with the places you visited to eat, because from what I’ve read, it doesn’t seem as if they were all that spectacular. Congratulations on the new show!! I’ve got some catching up to do with the movies, now that I’ve finally figured out which ones I should be watching. I was thinking three weeks before bringing the pups, but I haven’t moved in 25+ years, so I obviously don’t have a clue. And I finally got to watch SGU tonight. So action packed, both emotionally and physically. The special effects were fantastic. But I’m worried. I started liking Rush. I can’t figure out if he’s really softy on the inside, or a sociopath. Really glad you’re getting some time off with great friends. Have a fabulous time in Vegas!